Yes, you read that title correctly. I fell in love last weekend. But not with a person, no. With Milan. This past week was fashion week in Milan: one of the most famous events that happens in the fashion industry. Sure, fashion week happens in several large cities, but how many people can say that they were at the fashion capital of the world during that time? Very few people.My friends and I were a little hesitant to go because the train tickets were a little bit pricey, but I think that we got more than our money’s worth in experiences and a good time. Our train arrived in at Milano Centrale at 10 am and we were more than ready to take on the city! However, we ran into the small problem of not being able to find out where we needed to go. This would have been a problem, BUT a marvelous woman who was traveling alone named Katherine knew exactly where we wanted to go and SHE TOOK US THERE. We were so grateful and amazed that this even happened. 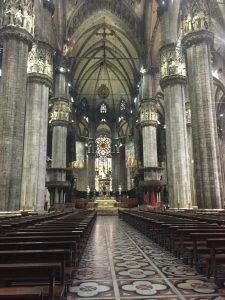 Our destination was to the Duomo which was the main shopping district/ the name of the Milan cathedral. The first plan for the day was to visit the cathedral. Next to the cathedral, was a line of people in red tents, so we checked that out before getting the tickets. To our surprise, the line was actually a line to gain FREE ACCESS to the terrace of the cathedral. All they had to do was calculate our heart rate before and after walking up the stairs. Of course we jumped on this opportunity that saved us 14 euros. The rest of the day was spent wandering around Milan and enjoying this new city. On Sunday, we spent more time exploring the city, but the most important things were to see The Last Supper and go to a fashion show. Before arriving in Milan, I looked up some places where fashion shows were going to be happening. We went in with an idea, but we actually had no idea where to go. Looking extremely lost allowed us to meet two Italian girls who were looking for the same show. So, we worked together and walked 2 miles to the Dolce and Gabbana fashion show. It was insane how many people were there and how fabulous the models and attendees looked! After all of the fashion bloggers and models cleared, we headed to the Santa Maria Della Grazie museum to see The Last Supper. When we arrived at the museum, the worker explained to a man before us in line that there were no more tickets available and that we should have made reservations 2 weeks ago. We were pretty bummed about this because it’s such an iconic piece of Christianity and it would have been incredible to see it in person. When we stepped outside, my friend realized that the man who was in front of us in line was Michael Phelps with his fiancée and manager. We were 2 feet away from a celebrity and didn’t even realize it!To continue on our day, we decided to check out a castle that was close by that also gave us discounted tickets for being students! That was our last expedition for the day and we headed back to Milano Centrale to go back home. So when I said that I fell in love with Milan, it’s probably understandable how. We had such a good time when we were there! Now, my heart is divided between Chicago, Rome, and Milan. Prada, Gucci, and Versace– Oh My!